Beautiful, scenic, and secluded cabin rentals in the north Georgia mountains just three miles from the Bavarian-themed Alpine Helen, Georgia. NOTICE: In the past we booked credit card reservations through this site, but due to the confusion of maintaining and coordinating two calendars (our own and VRBO's) and the cumbersome way we had to deal with credit cards, the site is now informatioinal only. Use it to find the best and most appropriate activities in the Helen area and in the most interesting attractions in slightly distant areas beyond. It contains up to seventy videos, and we try to add to it each time we go to Helen, making it one of the very best sources of current information on what to do and where to eat in the area. This spring will feature a fishing site plus a walk-through visit to Babyland General Hospital in Cleveland, GA. IN ORDER TO BOOK, THE CABINS ARE LISTED INDIVIDUALLY ON THE VRBO WEBSITE, and you can easily book through there (www.vrbo.com/750370 for Seclusion and www.vrbo.com/750372 for Cozy Nook). Please do not call us for rates or for help in booking, as all we can do is refer you to these booking sites; simply pull up the VRBO site for the cabin in which you are interested. You cannot tell if the cabins are booked on our informational site, because we don't coordinate a current booking calendar here with the active VRBO site. For the same reason, the review section on this site is almost two years behind, so for FOR CURRENT REVIEWS AND CALENDARS ON OUR CABINS, PLEASE GO TO www.vrbo.com/750370 for Seclusion and www.vrbo.com/750372 for Cozy Nook. Thanks so much for visiting our informational site, www.acornsofgold.com, and please return to it at your convenience for needed information on the Helen experience. Only three miles from downtown Helen, Georgia, but it feels like these rustic cabins are totally isolated. 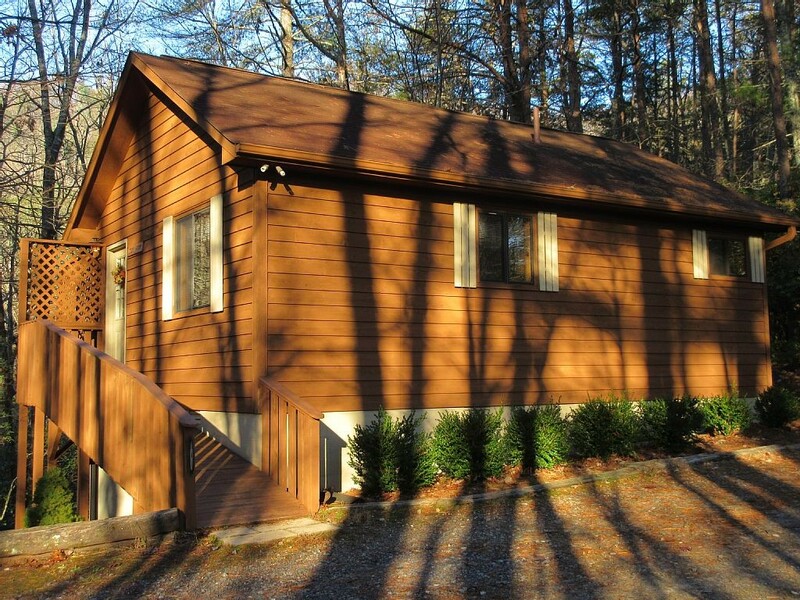 Each cabin is also located in deep rhododendron forest and adjoin almost 9,000 acres of the Chattahoochee National Forest for maximum privacy. Numerous activities abound in Unicoi State Park (trout fishing, beach, lake, boating, hiking, stunning Anna Ruby Falls). Many walking trails are also in the area, including a nearby segment of the famous Appalachian Trail. Just three miles away from the Bavarian-themed Alpine Helen, Georgia. In Helen, you will find great restaurants, shopping, tourist attractions, river tubing, golfing, canoeing and kayaking, horseback riding, and more. Only three miles from downtown Helen, this two-bedroom rustic cabin is totally isolated. The spa area of the deck is covered and the deck is totally secure from prying eyes. A well-accommodated full bath serves each bedroom. Guests opting for one-bedroom pricing enjoy the comfortable downstairs queen bed with full bath, while rental of both bedrooms allows access to the upstairs king (master) bedroom as well. Recently purchased, redecorated, and upgraded in several areas, this cabin is also located three miles from downtown Helen, but it feels like this one-bedroom rustic cabin is totally isolated. It is the perfect place for a romantic getaway with little to no possibility of unwanted visitors, traffic, or noise. I am a native Georgian, and both my husband and I grew up in the mountains of northern Georgia. I have a college degree in English, and I taught high school English for several years, including while my husband was serving his one-year tour in Vietnam. Helen and the surrounding areas are famous for fine, even elegant, dining experiences, as well as simple informal and filling but low-cost fare. We’re trying to cover as many restaurants in outlying Helen as well as some of the country eating places, plus the best restaurants in nearby towns such as Clarkesville and Dahlonega. EVERYBODY, it seems, wants to see a waterfall. Some want a lot of exercise on a long walk in to a remote, seldom-visited cascade; some want to practically see the falls from their vehicle; most want something in between. How far is it to Helen? Counting the short distance from the highway to the cabins, it is approximately four miles to downtown Helen, almost all of which is extremely good asphalt highway. The drive from the cabins to downtown Helen usually takes less than ten minutes. What is there to do in the Helen area? You’ve certainly come to the right website to have that question answered! This site already contains a dizzying array of local area activities, most complete with descriptions, how to get there, photos, and video tours. We will be adding to this monthly, so that acornsofgold.com should be the premiere site for discovering things to do in the Helen area, even for people who don’t book our cabins. In addition, all our guests get an attachment with their final instruction letter that is entitled “64 Things To Do in the Helen Area.” Bottom line: There is plenty available to keep visitors busy. That is why Helen is the second-most-visited place in Georgia by tourists (first is Savannah, but we may overtake them!). Where is the best place to eat in Helen? That requires taking into account a lot of personal preference. But again, you’ve come to the right website. We have a whole section on restaurants, including videos, directions, photos, etc. Take your pick! We intend to make this section more complete on every trip to Helen, so more restaurants should show up on the site almost monthly. What an amazing place! It was everything that was promised and more. Private, very clean and perfect for a getaway weekend for 2! Easy to get to and such a peaceful secluded spot. We will be sure to return. We enjoyed our recent stay. It was nice, very clean, comfortable and relaxing. The weather was perfect. We love Helen and loved the cabin. It was a perfect anniversary weekend. My husband and I enjoyed our weekend in this cute little cabin. It is neat, clean, and cozy. Perfect for a family or a couple for a kid free get away. We particularly enjoyed the privacy. From the deck you can't see any other cabins through the woods. 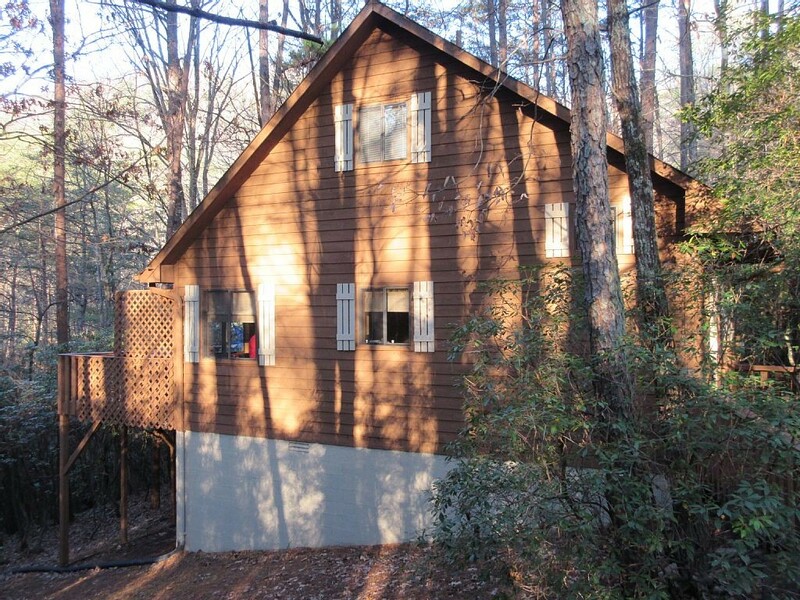 Have questions about our cabin rentals? If you'd prefer to use a form to contact us, that's fine too. Just click the button below to go to our Contact Form page! I'm becoming a veteran of the cabin rental business and I know what I like and what the discriminating traveler wants and expects. I'm a native Georgian, born, raised, and educated in the State, and I've been a housewife most of my years (though I have a college degree and taught English in high school for a number of years). Seclusion is the BEST ALTERNATIVE to Cozy Nook! Try Seclusion if Cozy Nook is booked! Now all our business is through VRBO!